Landscape Architect : Thomas Ford, R.L.A. This sculpture and park commemorates the ratification of the Constitution of the United States. The sculpture consists of a 13 foot bronze quill feather laid across a stainless steel cube. The cube is etched with the Constitution and its twenty six amendments (circa 1987) and is set amid boulders of the local Delaware granite. The stainless steel cube stands on a point representing the delicate balance of the three branches of the federal government. The polished letters reflect the surrounding landscape and are meant to be a symbol of the Constitution’s reflection of the changing human landscape of the country. The stars and stripes pattern is representational of the flag of the original thirteen states. The central star stands for the creed of individual human liberty proclaimed in the Declaration of Independence; that "all men are created equal" and are equally endowed with unalienable rights. Accenting the central sculpture is a low serpentine wall which bears granite caps inscribed with the names of the thirteen original states and the dates they ratified the Constitution. 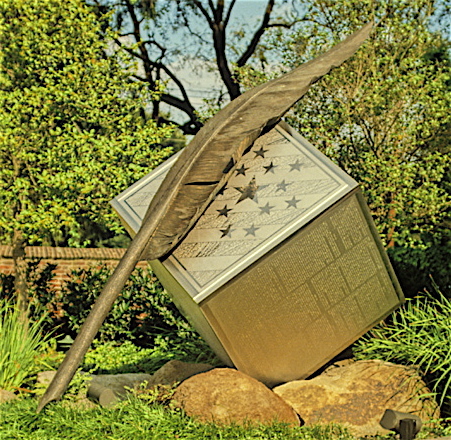 The nib or point of the quill is pointing to Delaware, the first state to ratify the Constitution. The park is located in Dover, the capitol of Delaware. 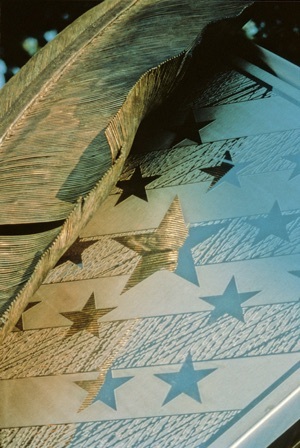 The sculpture was commissioned to celebrate the 200th anniversary of the ratification of the Constitution on 12-7 1787. Constitution Park was dedicated on 9-17-1988.